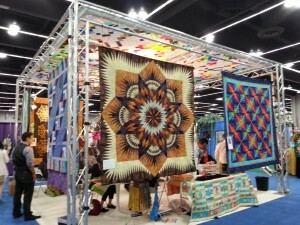 Continuing on the theme of Spring Quilt Market in Portland, another feast for the eyes was an inspiring special exhibit of some of the award winning quilts from the International Quilt Association’s 2012 show, Quilts: A World of Beauty. 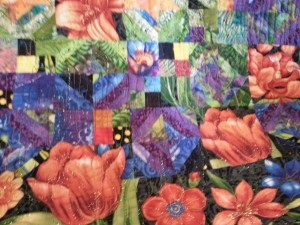 I’d like to share some of these wonderful pieces with you. 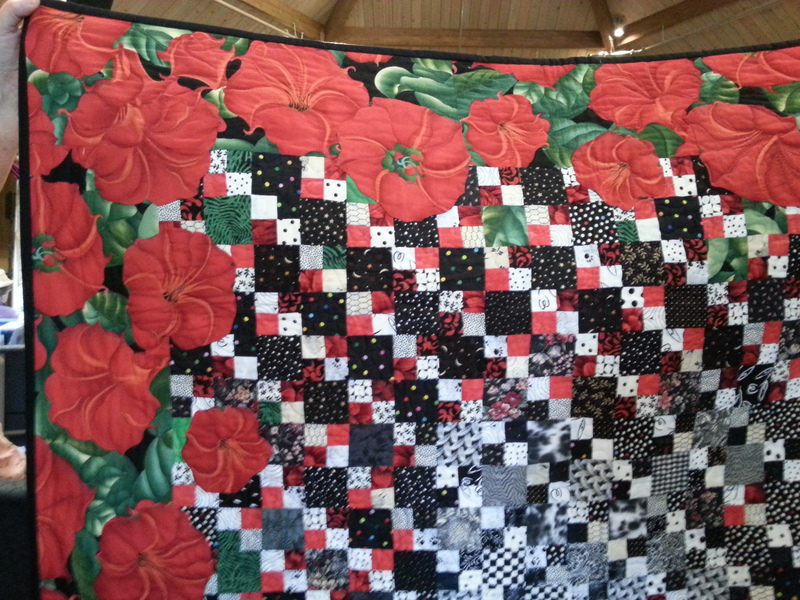 The photos don’t do the quilts justice, but at least you will be able to appreciate the artistry, workmanship and variety. 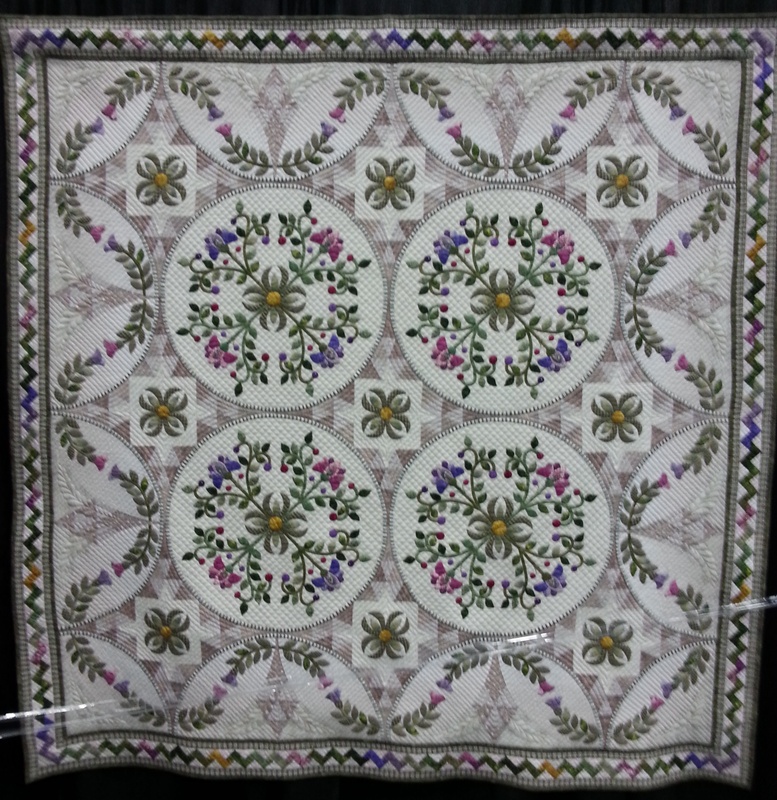 I loved this quilt, Flower Quartet, which won Honorable Mention in the Mixed Techniques category, made by Yasuko Sugaya from Chiba, Japan. 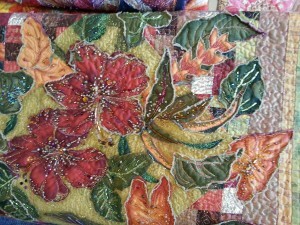 Her hand quilting, applique, embroidery and trapunto, were all so impeccable and the design was gorgeous. 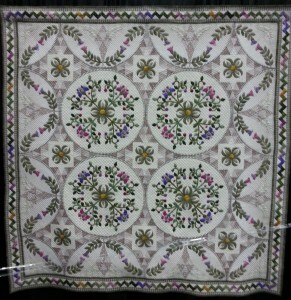 Another magnificent traditional quilt, ElaTED, was made by Ted Storm of S-Gravenzande, The Netherlands. “I started with my least favorite color and fabric: brown and plaid. 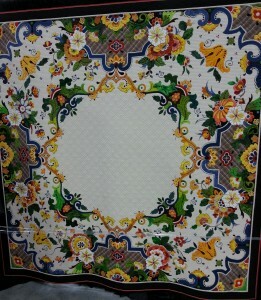 From there I took off, inspired by Delftware elements. 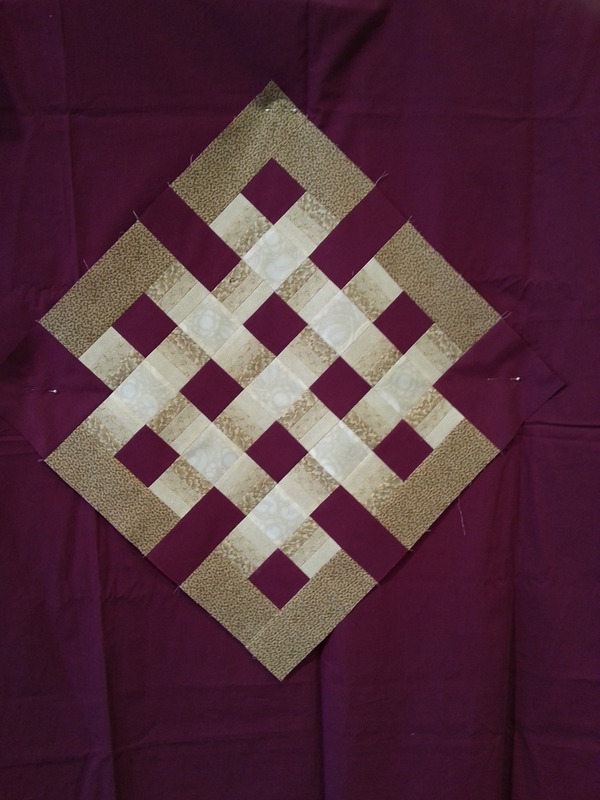 It was fun to create eight different asymmetrical designs in a symmetrical setting.” Like the last one, the hand work was incredible. 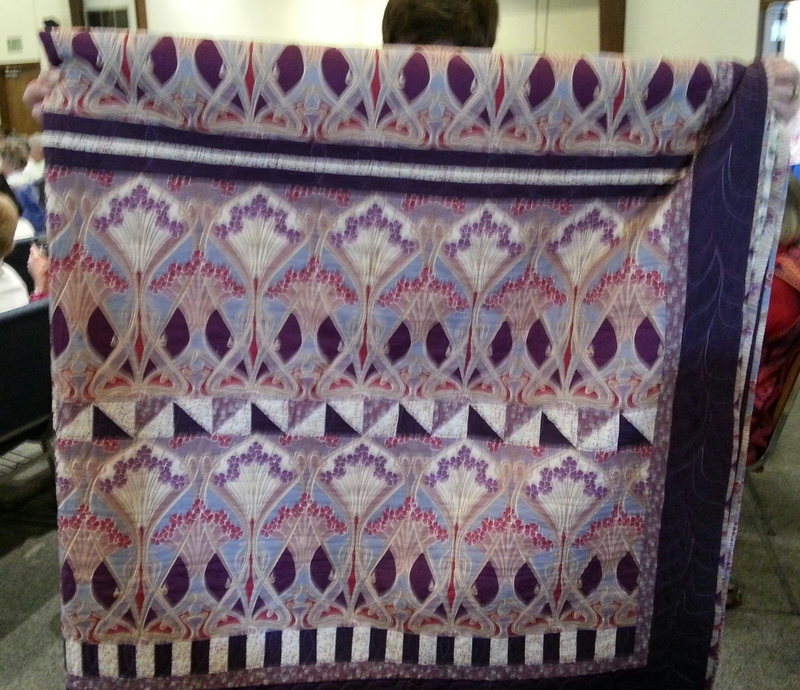 This quilt was in the Traditional Applique category and won the Founders Award. 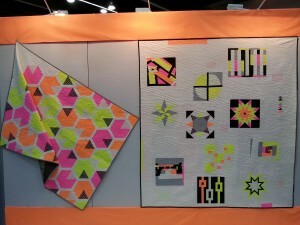 Here are two amazing pictorial quilts. 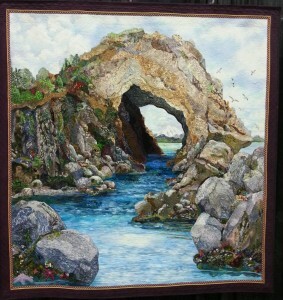 Kathy McNeil of Tulalip, WA, made the arch, Natural Wonders, and won first place in the Art-Naturescapes category. There was so much detail in this quilt, with tiny star-fish on the rocks and the use of 123 applique fabrics to produce such a realistic but imagined scene. 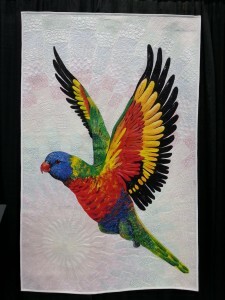 The Rainbow Lorikeet was made by Helen Godden of Latham, Australia. 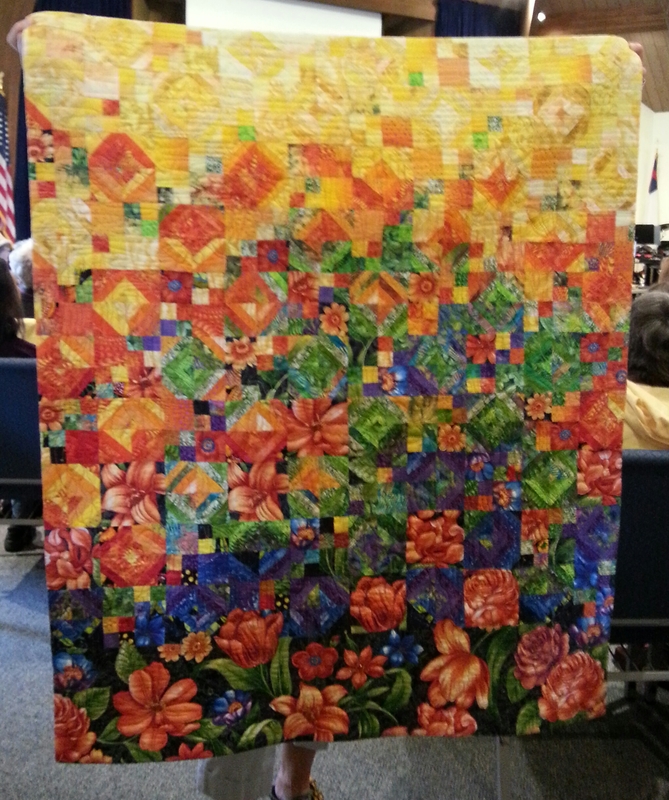 The quilt received an Honorable Mention in the Art-Painted Surface category. It was beautifully machine quilted, both on the background and on the bird. These bright and cheerful whimsical houses caught my attention. 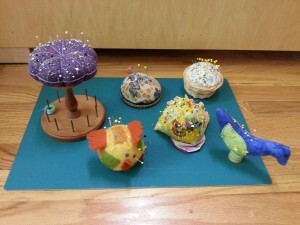 Tutti Frutti Village was made by Susan Bleiweiss from Upton, MA. 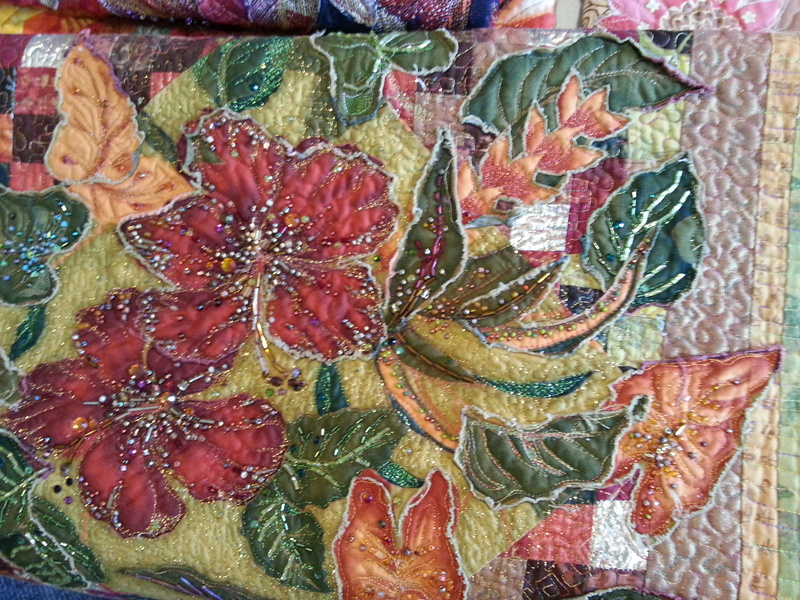 The techniques are fused, raw-edge applique with machine stitching and machine quilting. 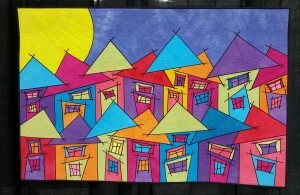 Susan won Honorable Mention in the Art-Whimsical category. Continuing on the theme of Spring Quilt Market in Portland, OR, I thought you might like a tour of some booths that caught my eye. 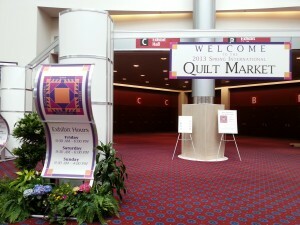 This is a trade show where the manufacturers and distributors sell to quilt stores. It was huge, with 480 booths spread over 24 aisles. 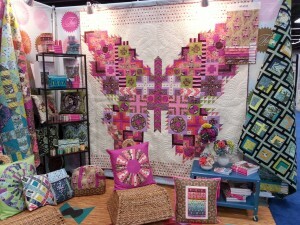 If I owned a quilt shop and was buying, I would be totally overwhelmed. 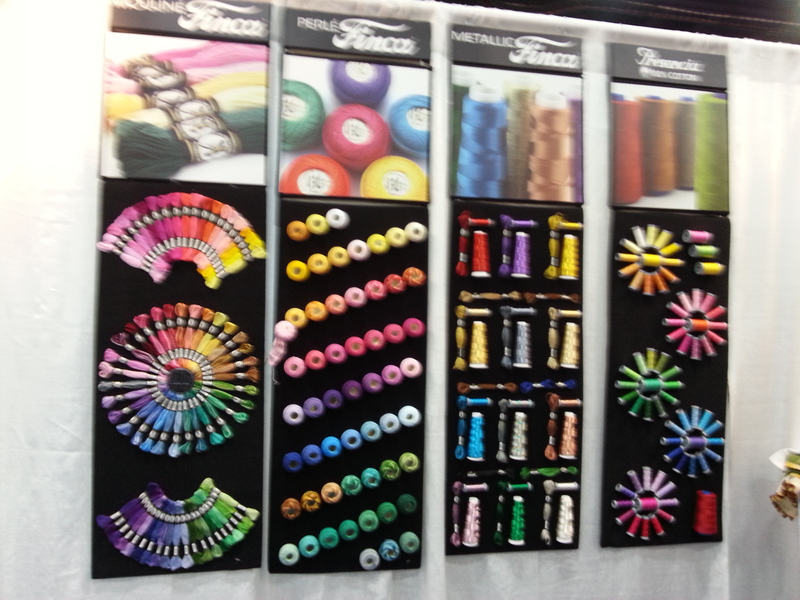 Below, the colorful displays at Moda Fabrics and Finca threads. 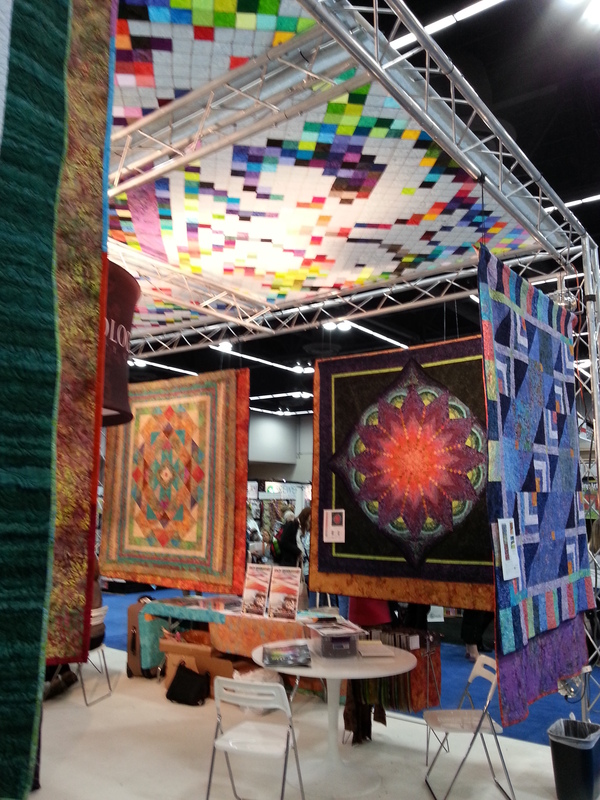 It took me a whole day to walk through all the booths in the exhibit hall. 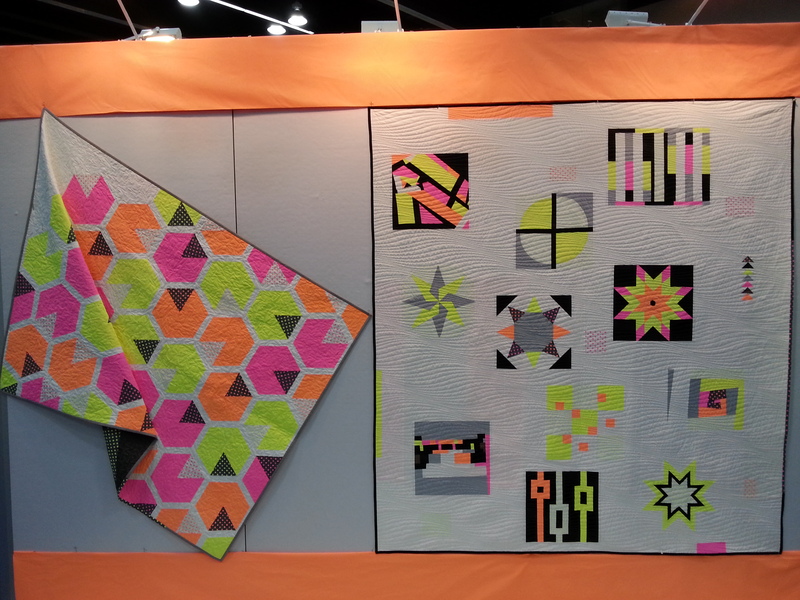 There were fabric manufacturers (over 100), publishers, and suppliers of every imaginable quilting notion and tool. 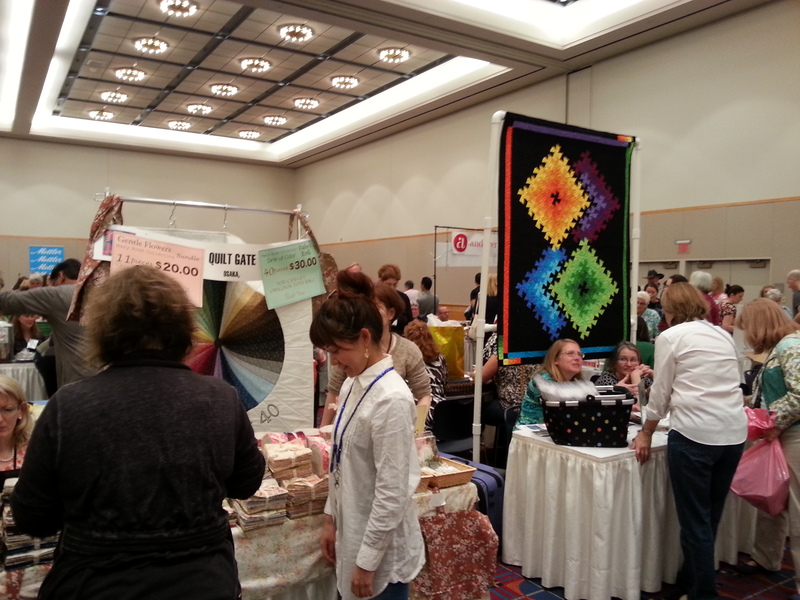 I stopped by three booths that had interesting new rulers (more on these another time). 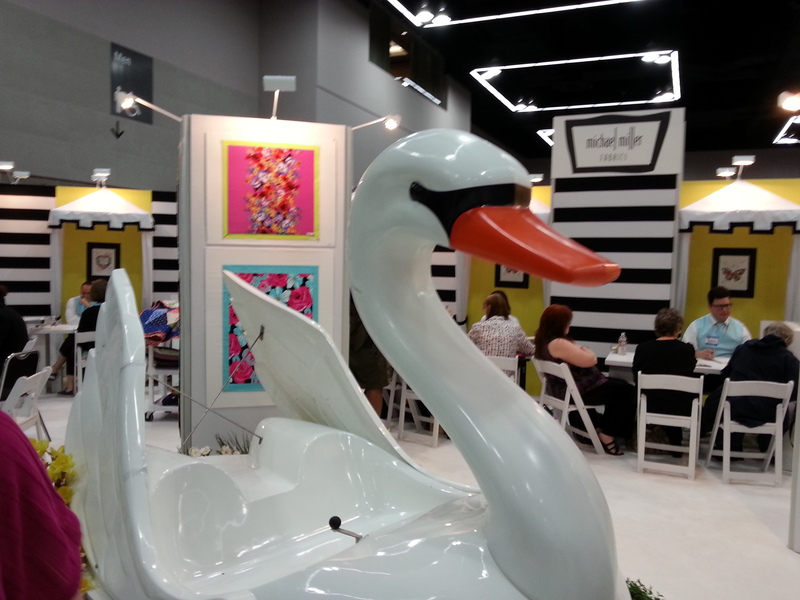 Some of the vendors went to extraordinary lengths to make their space special and to stand out from all the others. Anthology Fabrics Incorporated had an elaborate pieced canopy, spectacular quilts and extra lights to enhance their booth. Michael Miller Fabrics had neon orange, pink and yellow modern quilts and a giant swan. 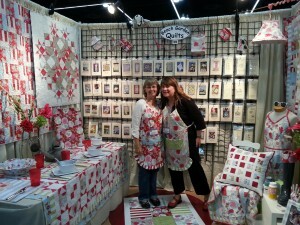 It was fun to see two vendors from home, Bainbridge Island. 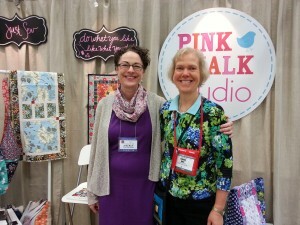 Here I am with Kathy Mack of Pink Chalk Studios. 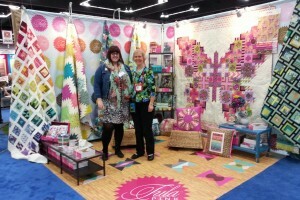 A few aisles away, Laura Jones and Lynnette Sandbloom were there with their Beach Garden Quilts patterns. 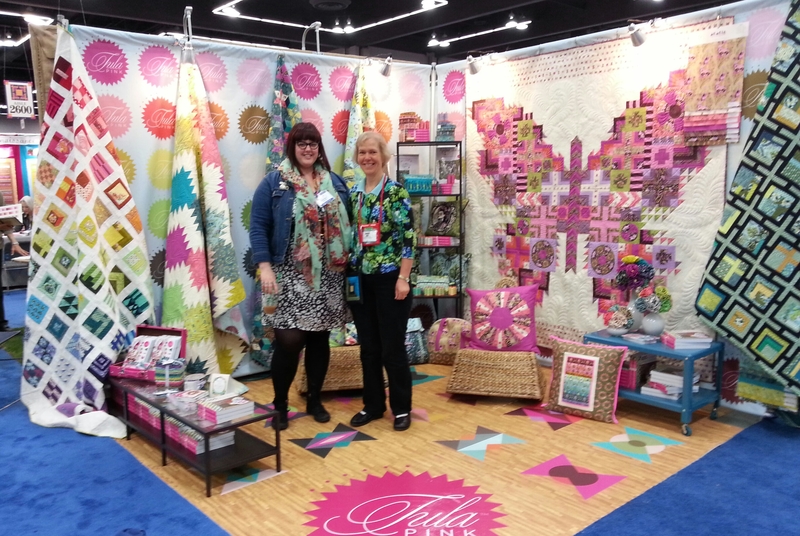 I loved pattern and fabric designer Tula Pink’s booth. 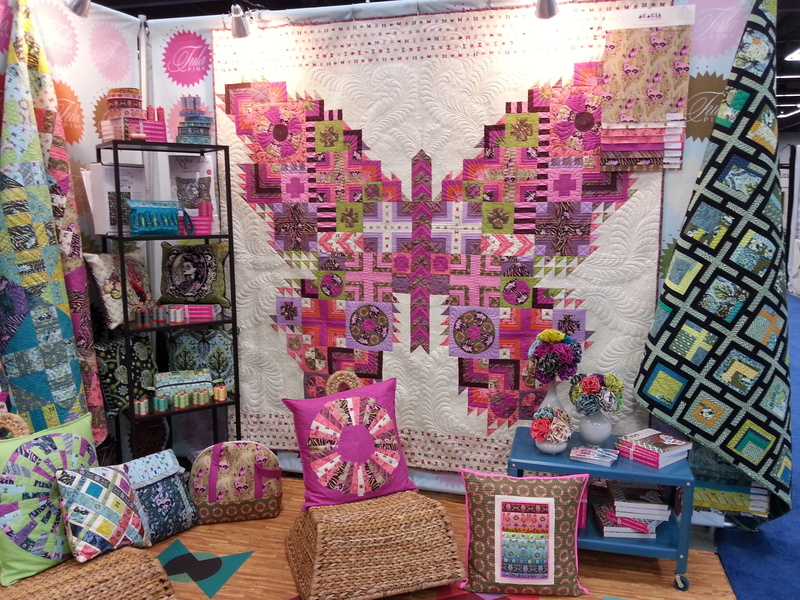 Here I am with Tula and I couldn’t resist a closer shot of that gorgeous butterfly quilt made from a variety of “modern” quilt blocks. 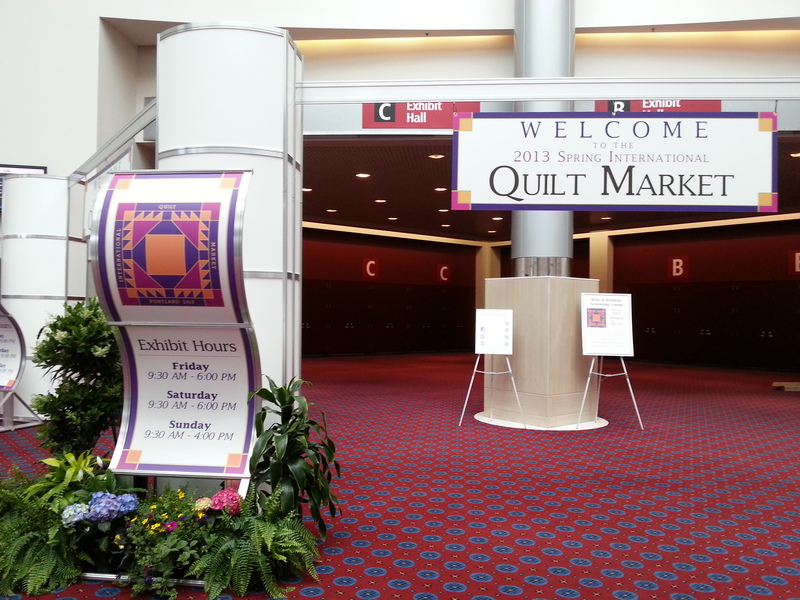 It was inspiring to attend and a great opportunity for me to reconnect with old acquaintances in the quilting industry. 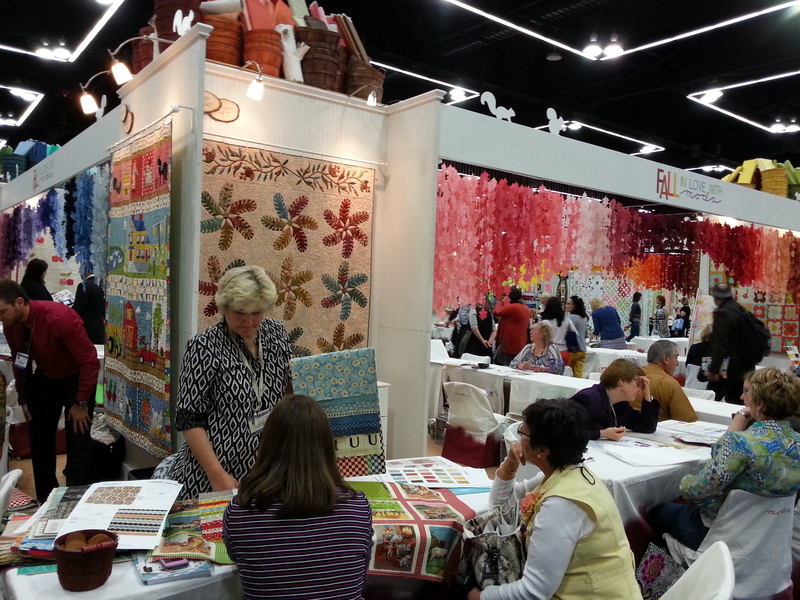 I’ve just returned from three days in Portland where I attended International Quilt Market. 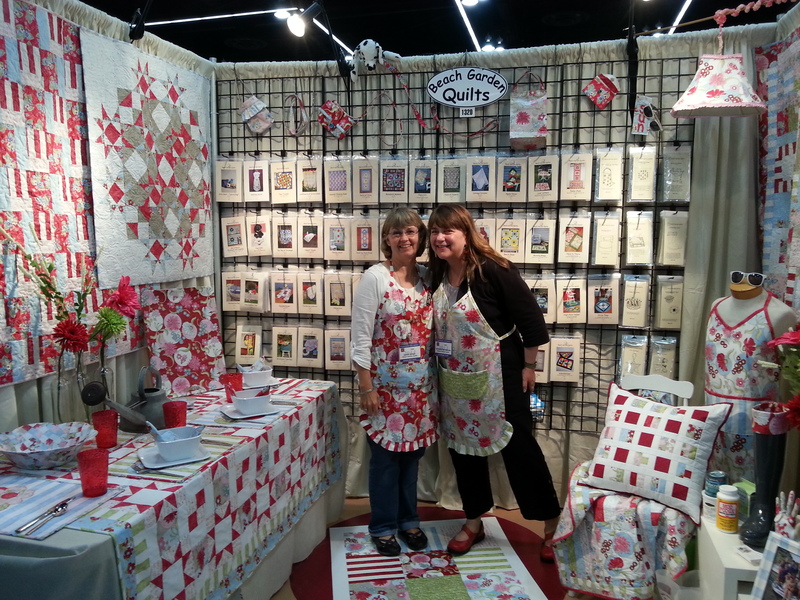 It’s four years since I’ve been to this trade show which is held every spring and fall, so I was excited to re-establish contacts in the quilting business and check out all the wonderful new products. As a preview to the exhibition halls opening there was an evening Sample Spree. 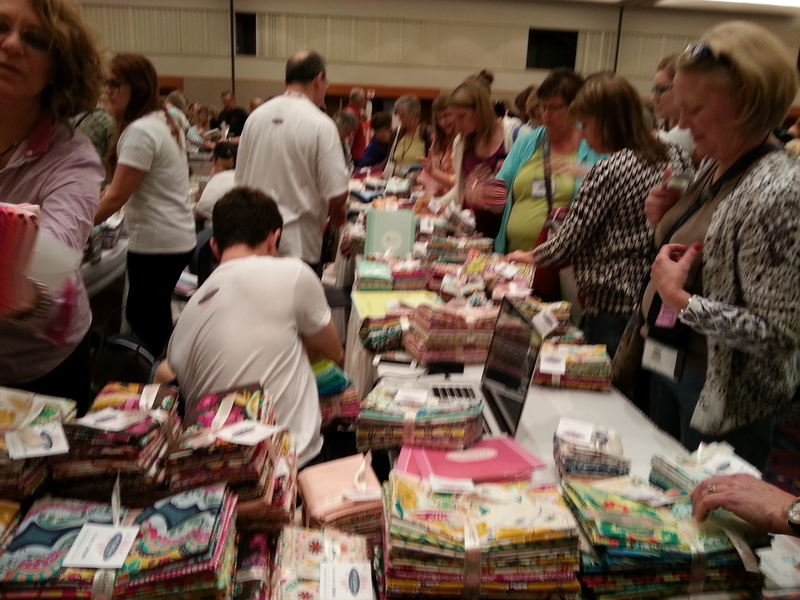 120 of the trade show vendors had tables and were selling their wares at wholesale prices. 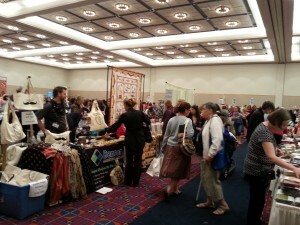 This is an extremely popular event and always oversubscribed. The queue to get in was insane and people began lining up two hours before the doors opened! 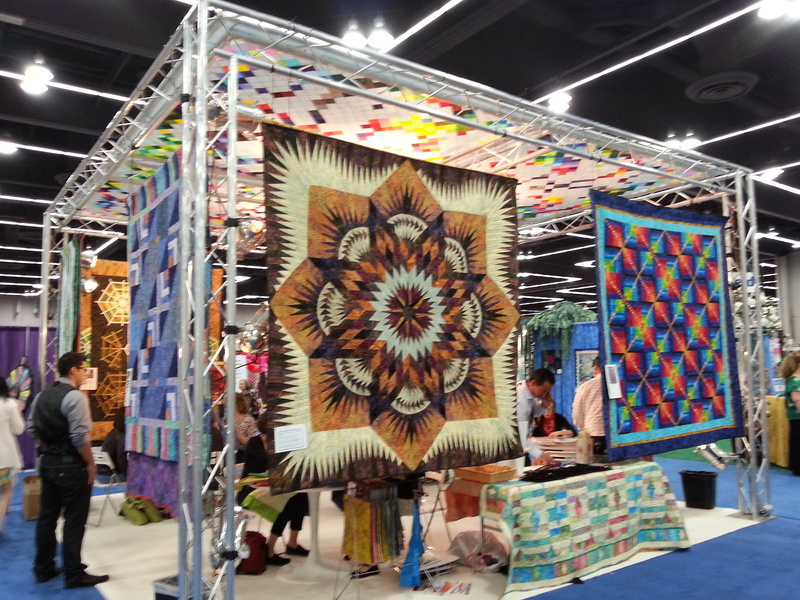 It is an opportunity for Market attendees, (quilt shop owners and employees, long-arm quilters, teachers etc), to buy fabric (mostly bundles of fat-quarters), tools, books etc., very cheaply for their personal use. It’s very crowded and you are only allowed to take in bags (no wheely suitcases). People race around loading up their bags and the vendors are usually swamped for the first half hour. I waited until the doors had been open for about 20 minutes before joining the stampede. After a while, some exhausted attendees parked themselves on the floor and rested while guarding their loot! 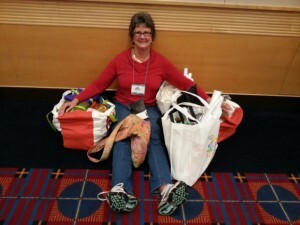 I chatted with this lady, Pam Johnson, from California, who assured “It’s not all mine, some of it is my friend’s!” Okay, I’ll admit it, I succumbed too and bought two large bundles of fat-quarters from Henry Glass & Co. $25 for 17 fat-quarters was too good a bargain to resist! Last Saturday, I thoroughly enjoyed the day in Edmonds teaching my Gateway to Mongolia class at Quilters Anonymous. I’ve been a member of this group for almost 20 years, but with my teaching schedule becoming much busier in the last two or three years, I’ve been unable to attend the meetings as regularly as I would like. 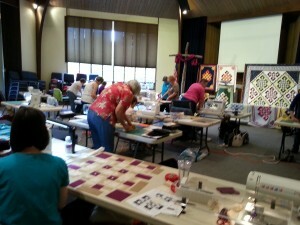 I was delighted to be invited to teach a class for them. 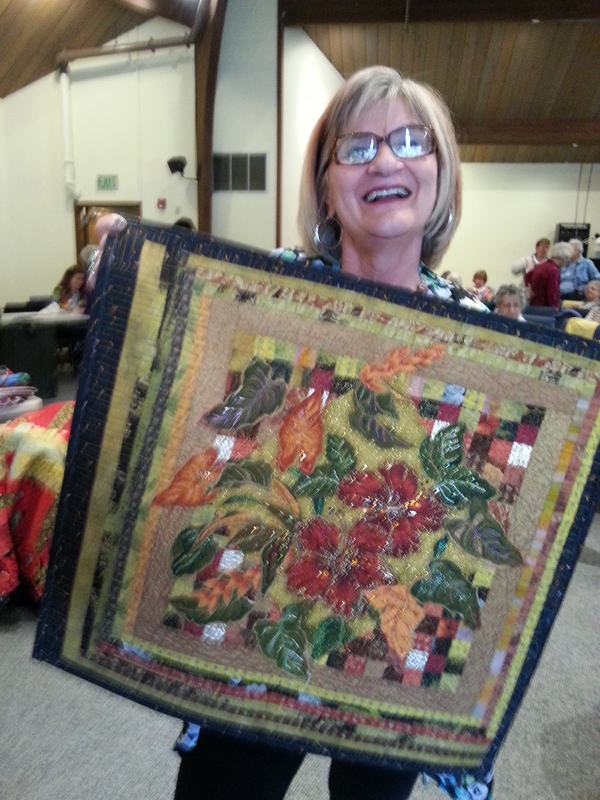 My class of 14 students was a mix of quilters I knew and others I hadn’t met. 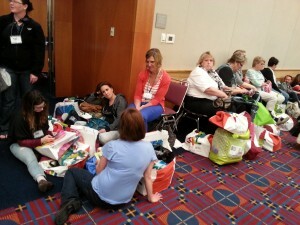 We had plenty of room for everyone to spread out. 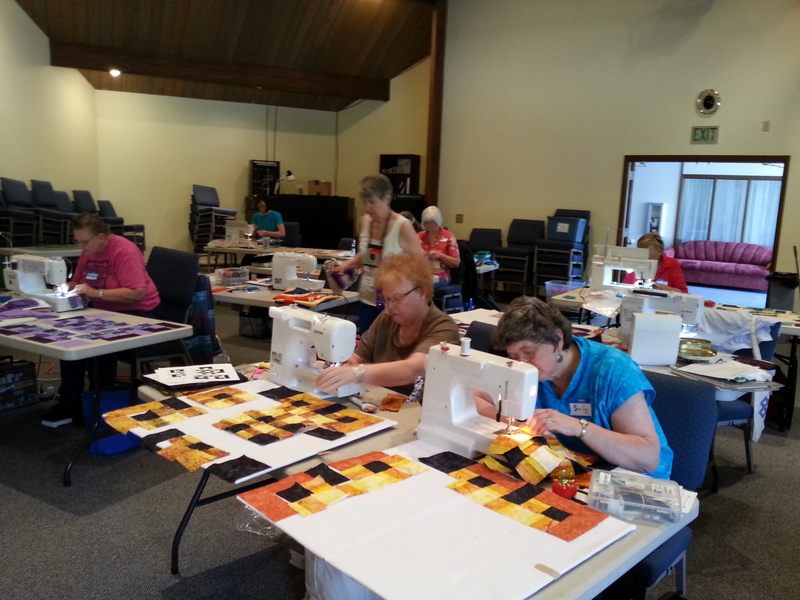 When the Olzii components are laid out for the large 20″ center block it’s great to have enough space for them next to the sewing machine. Small sections can be sewn and easily put back in the right position so they don’t get mixed up or turned around during piecing. 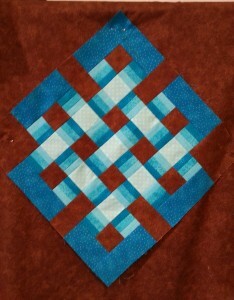 Most of my students completed the large block during the class. Here is a sampling of their work. This Olzii pattern is a traditional Mongolian design, often painted on the door of the ger (Mongolian yurt) and thought to bring long-life and prosperity to the people living there. In Tibetan Buddhism, it symbolizes the universe and unending cycles of life and death. 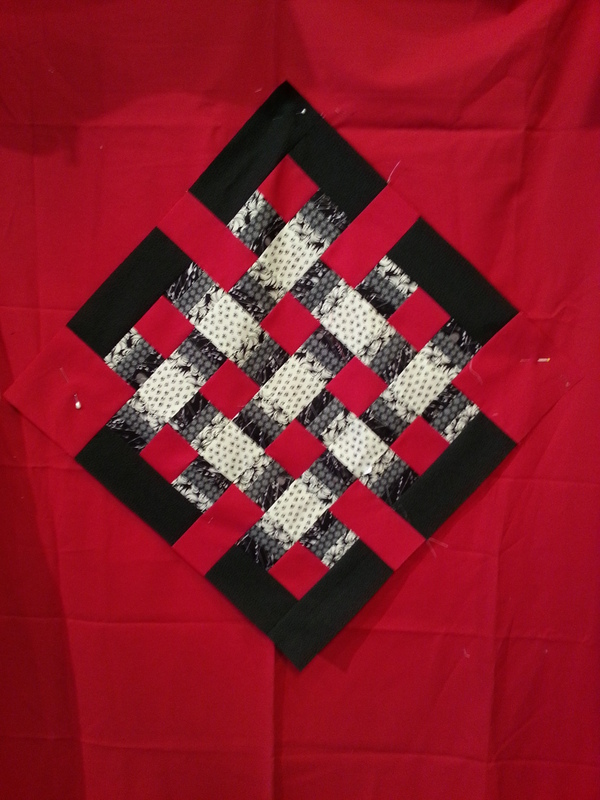 The block looks really funky during piecing, but as soon as it is placed on the background fabric, the Olzii motif pops and you can really see the under-over look of this never-ending knot. As each block was completed, we pinned them onto their backgrounds and oohed and aahed, congratulating the maker. 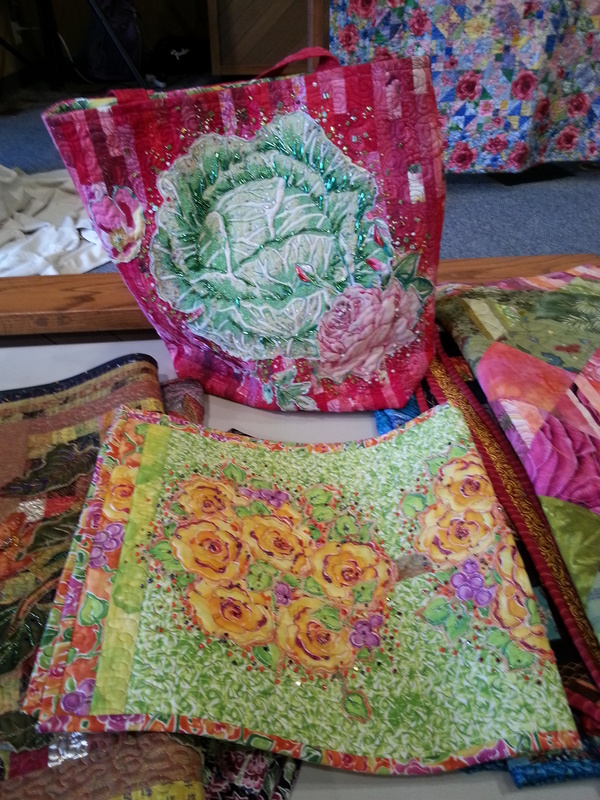 It’s always fun to see the fabrics that students bring to class. 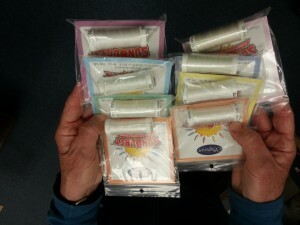 Every choice is different and students learn from one another as well as from the teacher. 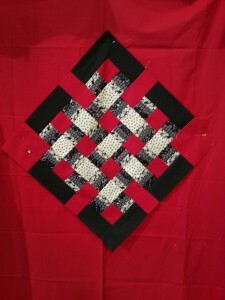 When I’m piecing my quilts I like to pin at intersections to help keep everything precise. 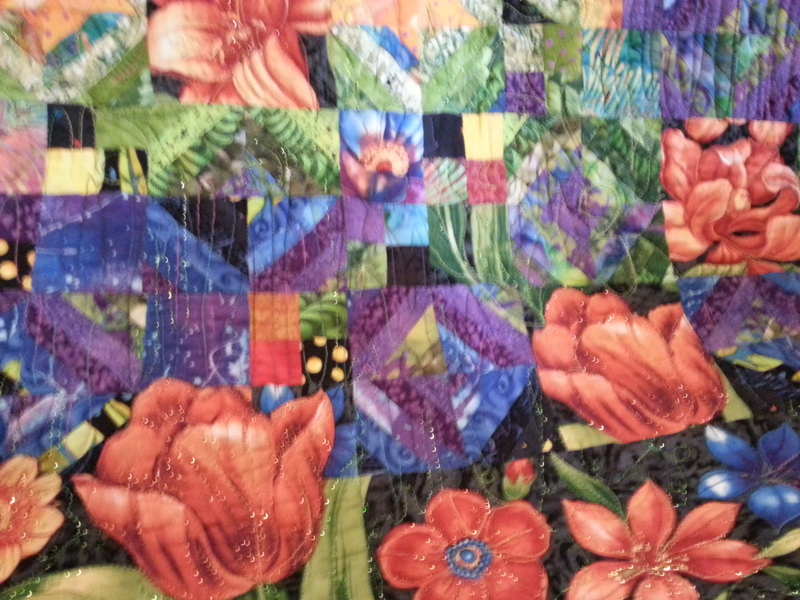 I always place my pins perpendicular to the seam line. 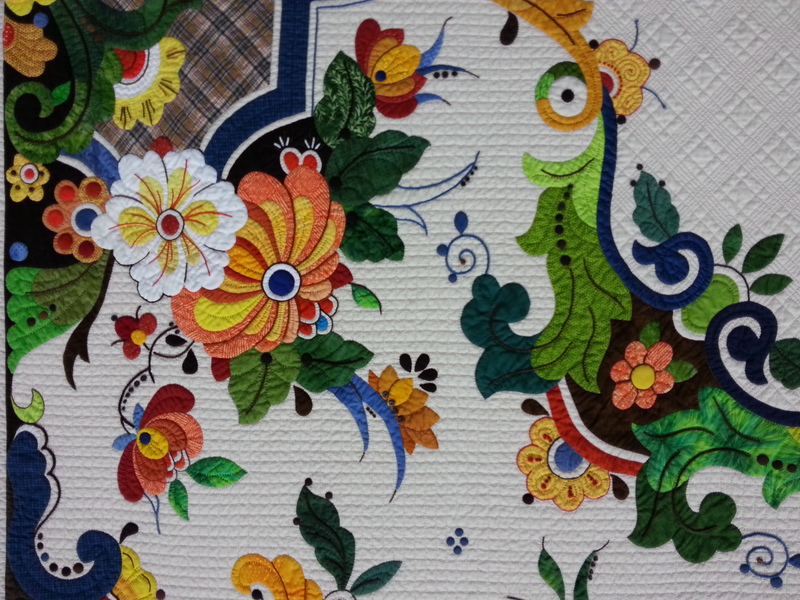 If I use narrow pins and sew slowly, my machine will run over them without any problems. 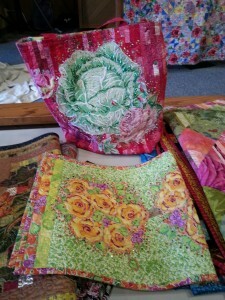 I’m always cautious about telling my students that they can sew over pins. Some machines are very finicky especially if the pins are fat, or positioned at an odd angle rather than at right angles to the seam line. If in doubt, take them out just before your machine reaches them. There are a variety of choices out there. 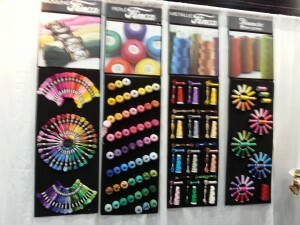 Here are some of the options. 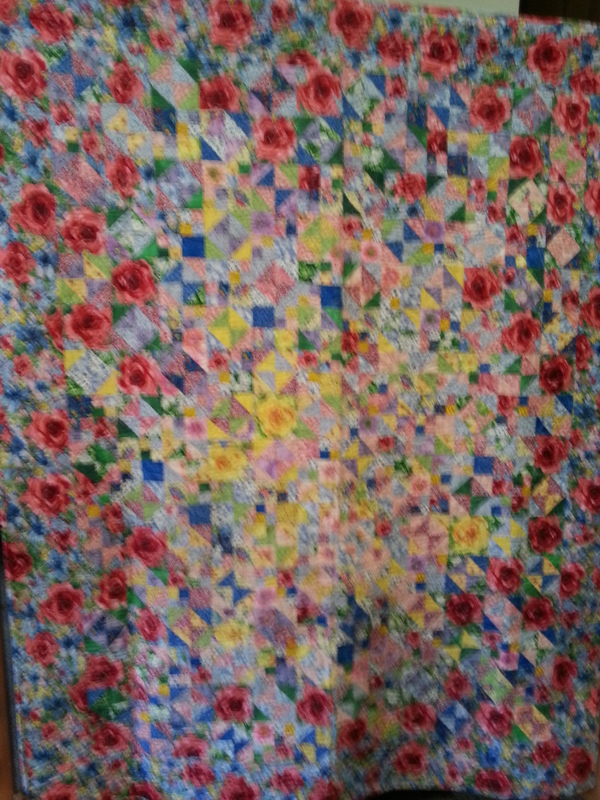 The pins on the far left are my favorite. These are Clover Extra Fine. They have yellow or turquoise glass heads and a nice slender shank. The ones next to them are Fine and work well too. 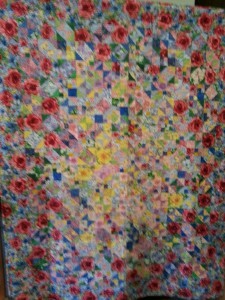 The Fine ones seem to be more readily available in the quilt stores than the Extra Fine. 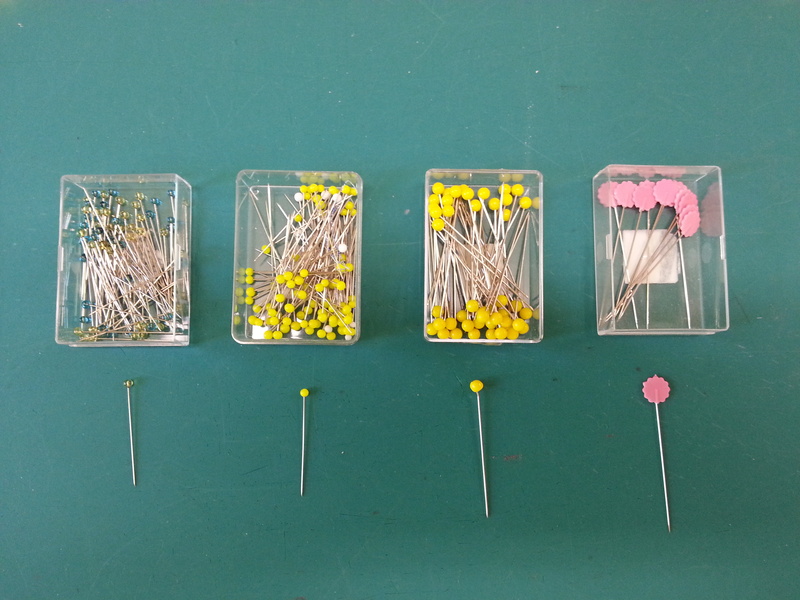 If you want one of the longer varieties, the flat headed flower pins, (far right), are good. 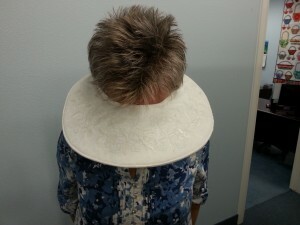 The shank is reasonably narrow and the head is easy to grab onto. 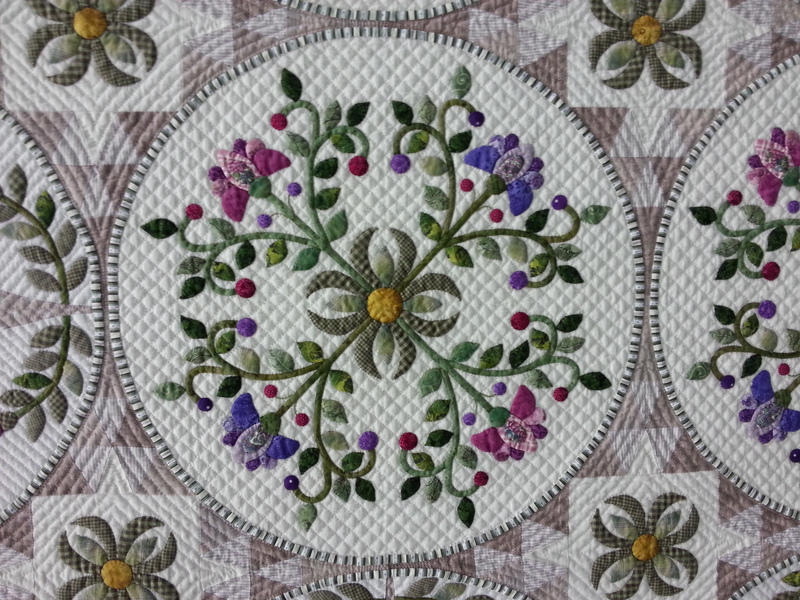 The second from the right and other similar pins, which are often called “quilting pins”, are too fat in my opinion and not appropriate for use when machine piecing. They do have their uses. 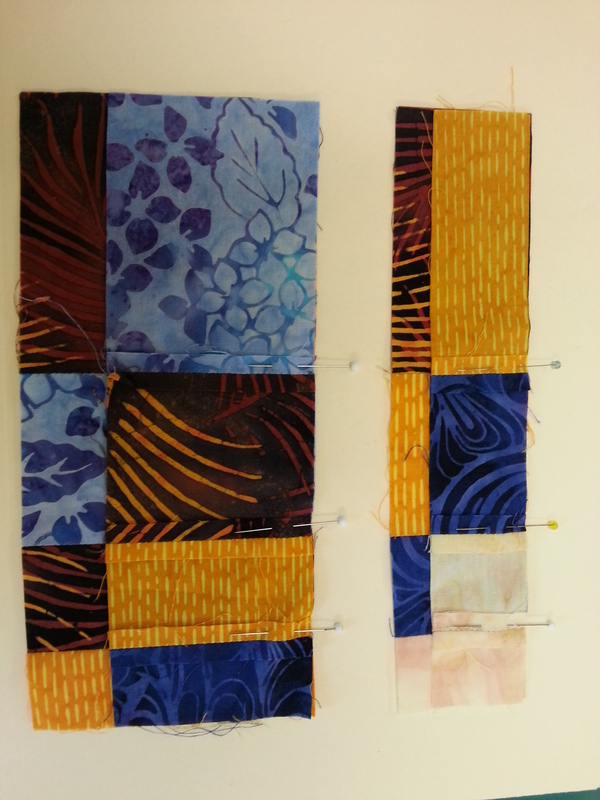 When I’m auditioning fabrics on my work wall, I use them to pin the fabrics, (which are often folded several times), onto the board. 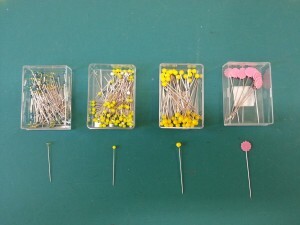 Some people swear by forked pins, but these are pricey. 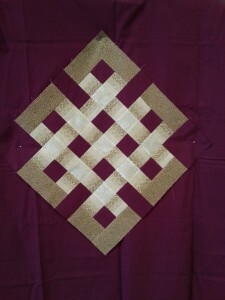 One of my students told me that the forks bend easily. They are problematic if the forks aren’t exactly parallel and can cause puckers. In my last blog, I wrote about my tour of the Superior Threads HQ in St. George, Utah. During our visit, Bob and Ricci showed us their amazing light sensitive thread. 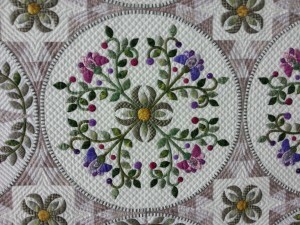 Indoors, the thread appears white. When you go outside in the natural light, it becomes colored before your very eyes. 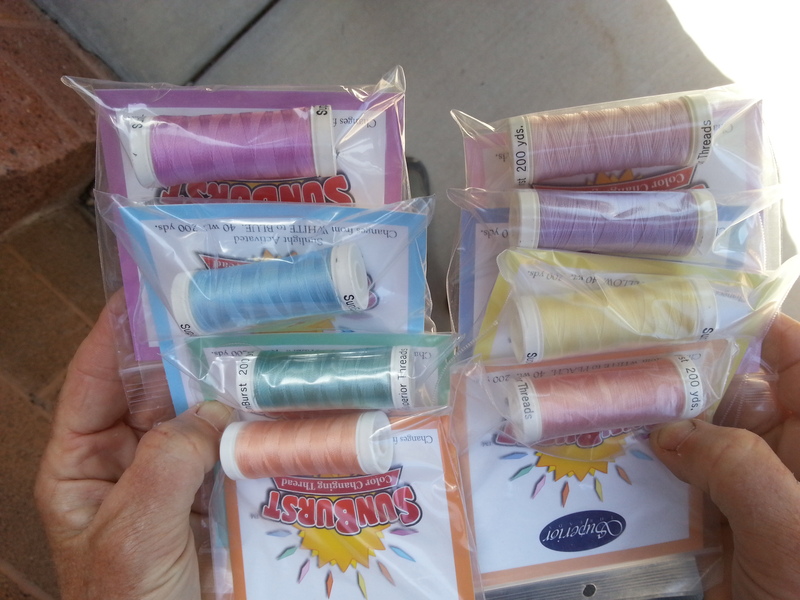 The coloration appeared in seconds in the bright sunshine of Southern Utah. 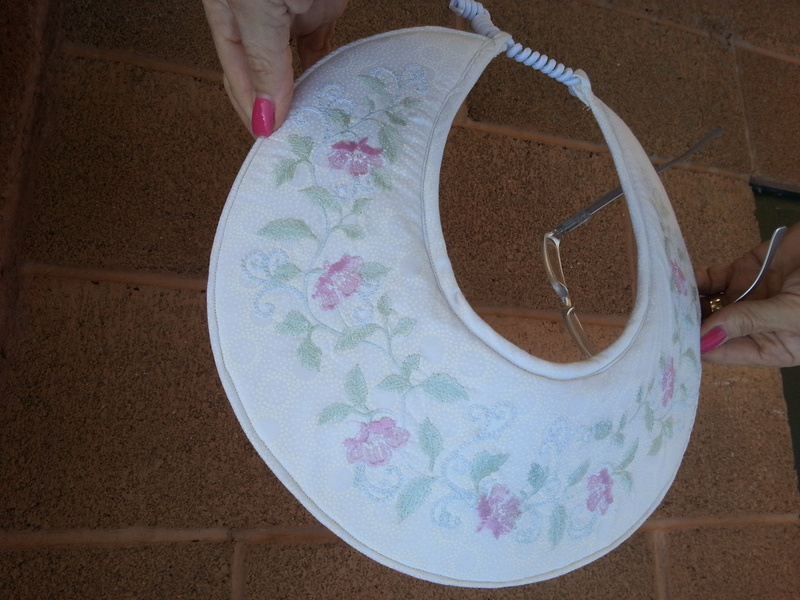 Apparently this is very popular for embroidery on wedding gowns and bridesmaids dresses. 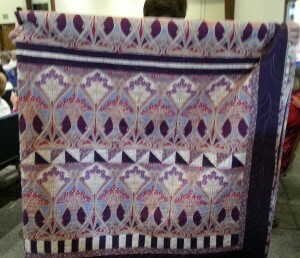 The dresses look the color of the fabric during an indoor ceremony and then the thread color appears for the outdoor photographs. Pretty awesome! There could be possibilities for indoor/outdoor lap quilts!